When I was a really little kid, my grandpa took me and my older sister to the Mcclouth’s farm auction. I was probably 4 or 5 years old but immediately I was captivated by theatrics of the auctioneer and the bidding. I wanted my grandpa, since I was too young, to get in on the bidding and ‘win” us something. And then that “something” appeared, a crate of 6 or maybe it was 8 chickens. I wanted chickens. We begged Grandpa to get those chickens for us, and he did. We were the winners of those chickens. I was so proud! Later in the day we met one of the Mcclouth, kids as I remembered it, and told him of our big win. He said, “you should have just told me you wanted the chickens, I would have given them to you.” But in my little mind, which still works the same way today, he totally missed the point. I wanted us to beat out everyone else for those chickens! Getting them without the fight would not be the same. But what he did give us, was a really beautiful red and gold rooster. I remember him carrying it out of the barn in his hands, the rooster turned over on his back. We then rode home with a truck full of chickens. We did not have a pen or shelter to keep our new chickens in, so as soon as we got home Grandpa was out in the backyard, he and grandma’s house was next to my parent’s house with a big field in between. The coop was on Grandpa and Grandmas property but in between our houses. Those chickens must have lived 25 years. It seemed like we had them forever. In the winter, a couple of them almost lost their feet because they did not know enough to stay inside and would venture out into the snow. We had to block their door shut to protect them. They all laid eggs, except the rooster of course and we, thought I think mostly my grandparents, ate the eggs. When I moved to NYC in 1993, there were chickens all over my neighborhood on the Lower East Side of Manhattan. Huge blocks that had pretty much gone derelict, was now chickens paradise. I loved hearing them in the morning, But as the neighborhood changed and new buildings went up the chickens disappeared. This year I am out in New Mexico and I want to stay here rather than go back to NYC, and if for no other reason, to build my own chicken coop and go to the action and “win” me some chickens. 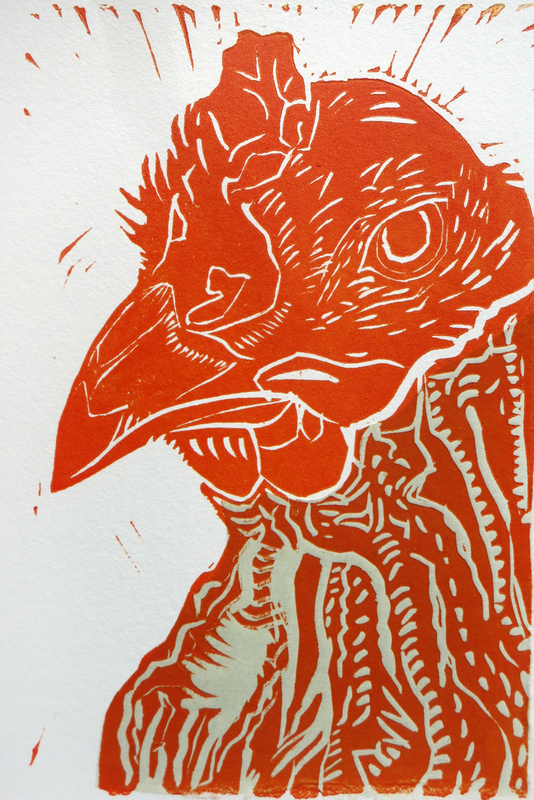 The chicken in this print is sporting a mint green turtleneck. The green is a piece of kitakata paper, that has been chine colled onto the printing paper. This is a process of printing and collaging at the same time. It is now available on Etsy at my StoneTrigger Press store for $20, there are only 10 of them available.